Second-place finisher John McNab, of Staples, competes in the 200 IM at the FCIAC high school boys swimming championships at Greenwich High School on March 4, 2018. 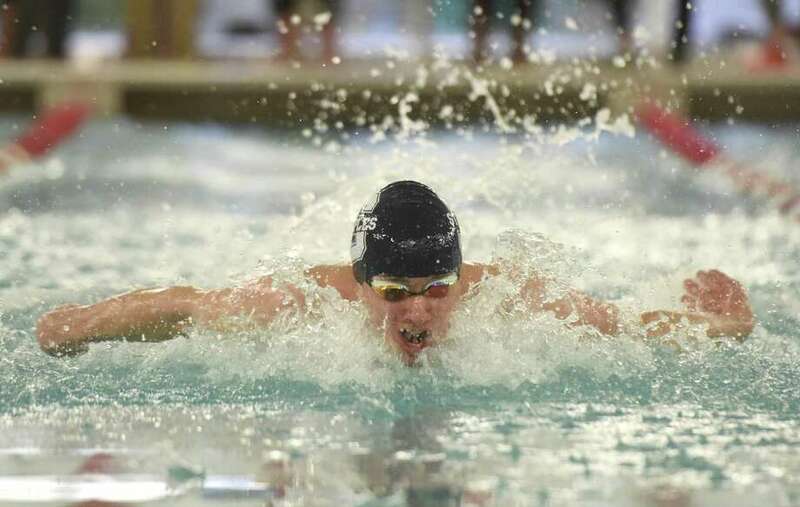 WESTPORT — The Staples boys swimming and diving team is looking to hit its stride as the postseason approaches. The Wreckers have won their last two regular-season meets, against the Norwalk-McMahon co-op 97-89 on Jan. 23 and against Wilton 95-73 on Jan. 24, in rare back-to-back dual competitions to even their record at 3-3. First-year head coach Todd Gordon said after the win over Norwalk-McMahon that his squad gets tested just about every meet due to the strength of the FCIAC, but he’s hopeful the Wreckers can end the regular season with a .500 or better record. Those swimmers who have a great chance to place high in the postseason, according to Gordon, are senior captains John McNab (freestyle events), Austin Twiss (backstroke, butterfly) and Justin Lovro (IM, butterfly, breaststroke) and junior Nick Lott (freestyle, back) and sophomore Justin Lessing (sprint freestyle). Gordon is also excited about the Wreckers’ relay teams, which have a shot at placing high in states, he said. McNab won the 100 freestyle at states a season ago and Gordon expects him to be a contender in all the events he competes in. Twiss has been undefeated in the 100 back and he hopes to place high in that event in FCIACs and states. “We definitely want to get ready for championships and do the best we can,” Twiss said. Lovro aspires to go far in the postseason, and he and his teammates are excited about what lies ahead. The captains, who each captured two events and two relays in the win over Wilton, said the team has potential to finish in the top five in the FCIAC. Staples takes Greenwich — the defending FCIAC, LL and Open champion — on Thursday at 4:30 p.m. The Wreckers also will be at Danbury on Monday at the O’Neil Center at Western Connecticut State University. Gordon would like to see his team continue to drop its times, especially in Thursday’s meet.